Redefine the summertime with Grilled Peaches with Cinnamon Sauce. 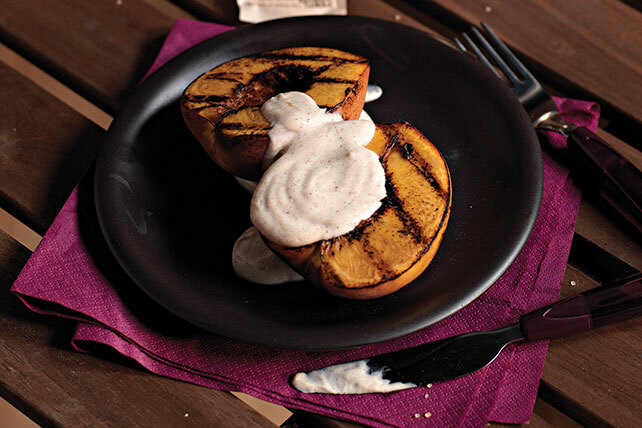 Grilled peaches are perfected with a cinnamon-sour cream sauce and a hint of honey. Mix sour cream, sugar and cinnamon. Brush cut sides of peaches with honey. Grill 6 to 8 min. or until softened, turning occasionally. Serve topped with sour cream mixture. Garnish with fresh mint sprigs before serving. Look for round, plump peaches that give slightly to gentle pressure. Peaches should have smooth, unwrinkled skins and a sweet aroma.